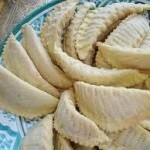 Kaab el Ghzal is a Moroccan food recipe of marzipan pastries. In a food processor, blend flour, 2 oz melted butter, and water just until the mixture forms a ball. Remove dough and knead on a floured surface for 10–15 minutes until elastic. Put the dough into a covered container and allow to rest for 30 minutes in the refrigerator. For the filling, blend the marzipan, orange blossom water, and butter in a food processor until well mixed and marzipan is softened. Set aside until needed. Divide the dough into 3 portions. Roll out on a lightly floured surface 1⁄8-inch thick. Cut into 6-inch-wide strips with a sharp knife. Cut the strips on the diagonal, creating triangles about 3 inches wide at the base. While working, cover the pastries with a moist cloth to prevent drying. To assemble the pastries, brush melted butter on the pastry triangle. 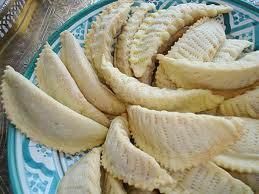 Take about 1 tablespoon of almond filling, press lightly but quickly to flatten, and lay on the base of the triangle. Roll up the pastry and filling together, starting from the base of the triangle. Prick the pastry in several places with a pin to avoid bubbling while baking. Cover rolled up pastry with a moist towel and continue with remaining pastry and filling. Place pastry on a buttered baking sheet and bake for about 15 minutes, or just until very faintly colored.